Unplug from smart phones and video games and reach out to the world as a family. Many families tell us that spending a week or two serving in a developing community offers a level of bonding that is hard to come by at home amidst everyone’s busy schedules and technology distractions. In addition, this experience will expand not only your child’s (or grandchild’s) global perspective, but yours as well. Whether age 6 or 96, your life will change in unimaginable ways. Teach conversational English to students ages 8 to 18 at the historic Reymontowka manor house. Minimum age: 6. Learn more about family volunteer vacations in Siedlce, Poland. Nurture toddlers and preschoolers through games, stories, music, and art at an orphanage or daycare center. Minimum age: 11. Learn more about family volunteer vacations in Lima, Peru. Use crafts, songs, charades, skits, and short field trips to practice English skills with summer school students. Minimum age: 6. Learn more about family volunteer vacations in Crete, Greece. Feed, teach, and care for preschool children in a lively daycare center. Be their center of attention! Minimum age: 6. Learn more about family volunteer vacations in Calderón, Ecuador. Work in Tanzanian classrooms in small groups on numeracy with students of all ages. Care for and provide love and support to children at a Daycare Center. Help paint, repair and expand classrooms and childcare facilities. Minimum age: 14. Learn more about family volunteer vacations in Tanzania. Care for and stimulate children 1 to 5 years old through reading storybooks, arts and crafts, and music and games. Or, assist with light labor projects like cleaning and painting. Minimum age: 8. Learn more about family volunteer vacations in Anse la Raye, St. Lucia. Feed, dress, stimulate, and love hospitalized children with physical and mental disabilities. Be a best friend forever! Minimum age: 10. Learn more about family volunteer vacations in Barlad, Romania. Read nursery books, play team sports, swim, fish, and bowl with primary school children. Minimum age: 8. Learn more about family volunteer vacations in Montana, USA. Practice reading English, with an emphasis on word recognition and pronunciation with children ages 6 to 12. Minimum age: 8. Learn more about family volunteer vacations in Rarotonga, Cook Islands. Help kids in grades 1 to 5 practice reading and engage their creativity and personal expression at Energy Express, a summer school program in June and July. Minimum age: 11. Learn more about family volunteer vacations in Appalachia, West Virginia, USA. Since 1984, we’ve engaged thousands of families on life-enhancing volunteer programs. You benefit from our 30 years of experience and can expect safe, family-friendly projects. Check out these reviews from parents who recently volunteered with their families. Give us a better idea of your family and the types of projects and/or countries that interest you. 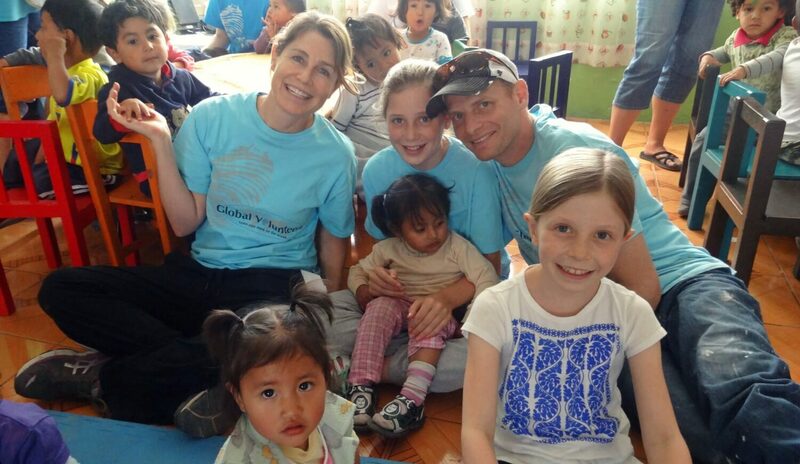 Super Summer Family Volunteering in Peru: The Hill Family Not a “Regular” Weekend. It’s Pongal Weekend!